For some reason it never even occurred to me that jellyfish ever made it to Iceland, but apparently they’ve been washing up all over the country. I need to watch more Discovery channel or something… 🙂 The ones in this article were near Garðabær, and I’m pretty sure this is the second time that Hafrannsóknastofnun has made an appearance in my blog. Marglyttur í þúsundatali rak á land í Garðaholti í Garðabæ um helgina. Þar liggja þær nú glitrandi í fjörunni. Víðar um land hafa menn rekist á marglyttuglás í fjörum. Thousands of jellyfish washed up on the shore at Garðaholt in Garðabær over the weekend. They lay there glistening on the shore. All over the country people have come across jellyfish remains on the beaches. The verb að reka has several meanings and seems to be used in many different expressions. Not only does the first paragraph have reka á land, which I took to mean washed up, but also rekast á + accusative, to come across. Að sögn Ástþórs Gíslasonar, sjávarlíffræðings hjá Hafrannsóknastofnun, berast marglyttur auðveldlega með straumnum, enda með takmarkaða hreyfigetu. Þegar skilyrði eru hagstæð, eins og nú, stillur og rétt hitastig, fjölgar þeim hratt með kynlausri æxlun. Ekki er algengt að sjá svo margar marglyttur reknar á fjörur en ekki er fylgst kerfisbundið með marglyttum á Hafrannsóknastofnun. Marglytturnar eru hættulausar en geta verið ertandi við snertingu og því er óráðlegt að stunda sjósund ef mikið af þeim er á sveimi. According to Ástþór Gíslason, marine biologist at the Marine Research Institute, jellyfish are easily carried by the current, since they have limited mobility. When conditions are favorable, like now, calm and the right temperature, they multiply rapidly through asexual reproduction. It is unusual to see so many jellyfish washed up on the shore, but they aren’t systematically observed at the institute. 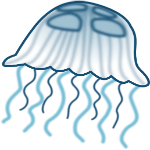 The jellyfish are not dangerous but can cause irritation when touched, so it is inadvisable to go swimming if there are a lot of them floating about. One thing that stood out in the paragraph was at the beginning – the phrase að sögn occurs all the time in news reports, and is followed by the genitive, thus the man’s name being in that form. But I was initially surprised that marine biologist was also in the genitive, I think the comma threw me off. It made sense after I thought about it a bit though – if you remove the person’s name and the comma you’d expect it. Just a small grammar point that’s easy to miss I think.